EU Proposal – Are We There Yet? You are here: Home / EU - Regulating Biking / EU Proposal – Are We There Yet? We had hoped to bring you the in-depth details of a final package of the EU Commission Motorcycle Regulation proposal, (aka the Approval and market surveillance of two – or three-wheel vehicles and quadricycles) from a European Council working party meeting which met this week. However while we wait for these details, we have had access to a briefing note from the 1st June 2012 and information from a trialogue meeting on the 19th June, both of which are in the public domain. The briefing note is from the Council Of The European Union to the Permanent Representatives Committee and the subject as regards the proposed regulation is – “Preparation of an informal trialogue”. The informal trialogue negotiations took place in March and June between the IMCO MEP negotiating team, the Danish Chairman of the European Council Working Party (of Member State Ministries), which aimed at exploring the possibilities for a first-reading agreement, hence to know the full content of this week’s meeting is very important. A Working Party on Technical Harmonisation (Motor Vehicles) examined the proposal on 27 occasions during the Belgian, Hungarian, Polish and Danish Presidencies of the council. The Danish Presidency is coming to an end therefore the timescale to complete negotiations on this complex and technical dossier will most likely fall to the next Council Presidency: Cyprus, which takes over from Denmark on 1st July. Meanwhile back to the briefing note from 1st June, which goes through the issues, with a full annex at the end, contains the draft proposal with new proposed text added and deleted. This gives an idea of where the proposal is heading towards and what may be expected to come out of this week’s meetings to achieve a final package agreement for first reading in the European Parliament. The main outstanding issues as included in the briefing note are below and can downloaded at Right To Ride EU – EU Proposal – Are We There Yet – pdf 376kb these include Advanced Brake Systems (ABS) and the exclusion of the lighter (L1 and L2 categories), the exclusion of L3eA2 (medium motorcycles) along with L3e-A3 (Large Motorcycles) from the anti-tampering measures, the deletion of Chapter XI of the proposed regulation as regards Individual vehicles approvals. Our conclusion is that once an agreement has been reached (aka the final package) this will be contained in the draft regulation which needs to be set into a full document. 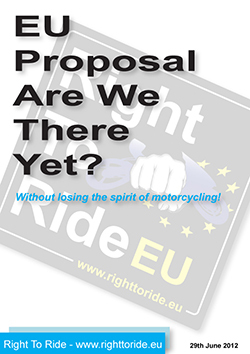 With the caveat that we await the full publication of the draft regulation to be voted on in the European Parliament, in order to have a good detailed read through, all is as well as can be expected regarding the freedom of motorcycling, for motorcyclists to modify and continue riding. Mandatory ABS, we will continue to hold the view that there is no way it will bring about a 20% reduction in fatalities over the next ten years in Europe and we have made that point very clear, basing it on legitimate research. We do however accept the Commission’s view that the industry is creaming motorcyclists on the extra cost of ABS, so with mandatory fitting, they will have to reduce the cost considerably to compete with bikes from India and China. Overall, the spirit of the proposal was to ensure that motorcycling could be brought in line with car regulations and offer consumers cleaner, safer and more technically advanced motorcycles. This seems to have been achieved without losing the spirit of motorcycling. Compulsory Advanced Brake Systems (ABS): the European Parliament proposes to extend the scope of compulsory ABS brakes to all motorcycles, including lighter ones (L1 and L2), whereas the Commission proposal made this optional (either ABS or Combined brake systems, CBS, which are less costly). Most delegations support the approach of the text in the Annex, which does not amend the Commission proposal (which therefore excludes the lighter (L1 and L2 categories). There is still the exclusion of Trial and Enduro motorcycles (completion machine used on surfaced and non-surfaced road but still need Type Approval to be enabled to be used on (public roads”) and mopeds from the mandatory fitment of ABS. There does not seem to be the realisation that this is already in place by the manufacturers and as Malcolm Harbour says as regarding consumer demand, please just leave this well enough alone! The European Parliament proposes to delete a step in the implementation of the Regulation (Euro 3) since already today many vehicles comply with the required technical specifications, and to advance consequently the implementation by one year (2016) for new types for Euro 4. This amendment is not supported by delegations, since it would create a legal vacuum for 2014-2016. Delegations prefer the approach of the Presidency text, which is supported by the Commission. However, further simplification might be looked into so as to find an acceptable compromise without legal void. A number of delegations still maintain reservations on a number of implementing measures and delegations that are conferred to the Commission in view of the implementation of this new Regulation. Although these Delegated and Implementing Acts are being formulated within the European Commission’s MCWG (Motor Cycle Working Group) which includes a variety of stake holders from the motorcycle Industry, Government Representative and rider organisations, they are “outside” the present negotiations and will not be decided on during the Plenary Vote in the European Parliament. However these delegated regulations are part of the legislative simplification which was announced as part of the overall European Commission proposal in October 2010. After the Regulations have been adopted the European Commission can propose technical adjustments to the Regulation, they cannot however constitute substantive changes. However, it is the job of the EU parliament to monitor the Delegated Acts. From a briefing from Malcolm Harbour, “This is an established procedure in EU law making. Previously, the Commission provided EU Member State ministries (in the Council working party) with a draft proposal on Comitology, in order for Member States to better understand the complete emerging regulatory picture. Where the Council had doubts or disagreed with the Commission, it asked the Commission to modify the relevant draft proposals. The briefing note explains that, “the Working Party has sorted out a number of technical issues with a view to finding an agreement with the European Parliament. The rapid resolution of these latter issues should be finalised in the coming weeks in the Working Party and the outstanding issues with the European Parliament for which a compromise text is finalised in the Working Party. Most delegations do not support the introduction of a new Article 18a by the European Parliament in amendment 49. A subsequent document dated 19th June from Council, deletes this article. The compromise text for Article 18 – Measures regarding modifications to the powertrain of vehicles – is proposed in the Annex of the briefing note and was prepared by the Working Party and could be acceptable for the European Parliament. Regarding what vehicle will be exempt from anti-tampering measures of a vehicle’s powertrain these are listed as subcategories L3e-A3 (Large Motorcycles) and L4e-A3 (Large Motorcycles with sidecar). 5. Without prejudice to paragraph 2, in order to avoid modifications or adjustments with adverse effects on the functional safety or on the environmental performance of the vehicle, the manufacturer shall endeavour to prevent through best engineering practice that such modifications or adjustments are technically possible, unless such modifications or adjustments are explicitly declared and contained in the information folder and thus covered by the type-approval. This paragraph has been re-phrased to clarify that the obligation is on manufacturers, not users and was from the UK delegation. However we understand that L3eA2 (medium motorcycles) will also be excluded from the anti-tampering measures. Thus a status quo remains on smaller bikes, which already come under existing anti-tampering regulations. Motorcycle enthusiasts and riders with special needs (Disabled Riders) will continue to be able to modify their vehicles and the aftermarket part sales and the repair and maintenance sectors will not be affected. The consternation of many UK and other European motorcyclists has been due to the misinterpretation of the term “anti-tampering” to mean ”anti-modification”. This has be the basis of a raft of protests, letter writing campaigns and other initiatives for some motorcycle organisations, magazines and anti-EU politicians to hang their hat on. Hopefully those MEPs and others working on this proposal, may consider something we suggested back in November 2010 which is that they clarify the difference between illegal modifications (i.e. anti-tampering measures) and legal modifications. In other words, instead of calling them “anti-tampering measures, call them what they are: “measures to prevent illegal modifications”. And to reiterate that any anti-tampering measures refer to new bikes! It would appear that the whole section and time scale complexities of OBD Stage I the implementation for the fitting of OBD Stage II has been deleted then changed. shall be equipped with an OBD stage I system which monitors for any electric circuit continuity failure, shorted electric circuits or rationality failure of the emissions control system and reports those failures which result in the emission thresholds being exceeded. Also from certain dates OBDI will include shorted electric circuits or rationality failure of the emissions control system and which is triggered when the emission thresholds are being exceeded. OBD stage I systems for these vehicle (sub-) categories shall also report the triggering of any operating mode which significantly reduces engine torque. L3e are to be equipped with an OBD stage II system which monitors and reports emissions control system failures and degradation which results in the OBD emission thresholds. However the UK delegation appears to have stated that this should be deleted from the regulation, so it is possible we will end up with what manufacturers are already fitting to motorcycles. Not a system that riders think will monitor and report their riding, their speed etc leading to enforcement agencies being able to access any data for prosecution. Of course if manufacturers want to equip bikes with systems that do this then that is down to market forces and whether riders will buy such bikes. It is reported that most delegations can now support the Presidency text, proposing three options. Although one delegation would prefer to merge options (a) full mileage accumulation and (b) partial mileage accumulation of at least 50 % of the full mileage. The Commission is opposed to this and wishes to retain three options. Durability is a requirement for manufacturers to state the durability of emissions so that emissions from the motorcycle at the start of its life cycle remain within certain limits to specific mileage. This would be particularly important, obviously for the environment and the promotion of cleaner motorcycles, but also for the rider if Emission Testing for motorcycles was introduced. For example in the UK at MoT time that the emissions remain within limits. Furthermore, apparently Council agrees with the European Parliament’s proposed two-step implementation timetable, which will give manufacturers more clarity (detailed measures all brought in together) and time. The first step for implementation of the regulation would be 2016. Individual vehicle approvals are included in Chapter XI of the proposed regulation, a number of delegates have doubts on the inclusion of Chapter XI in the Regulation, notably because the proposed Articles would not provide for a sufficient harmonisation of technical requirements. These delegates include the UK who has said that, “Including individual approvals in the Regulation would place a heavy burden on individuals and small companies. The added cost is disproportionate with the potential benefits. In some MS (Member States) there may be insufficient demand for such a scheme whereas MS that already have schemes in place will be obliged to modify them. However, UK could accept IVA within the scope of the Regulation provided it is clear that MS can retain existing national schemes. So if the Parliament agrees to not having detailed EU rules on Individual Approval (Type Approval) in the Regulation, this will be left to national rules. For this, only a the Motor vehicle Framework Directive’s IVA key wording remains, thus a mutual recognition by member states of each other’s National Individual Approval. Malcolm Harbour, Conservative MEP for the West Midlands, Chairman of the European Parliament Committee on the Internal Market and Consumer Protection (IMCO) has personally led on provisions leading to the automatic mutual recognition by competent authorities across the EU of individual type approval certificates. This is fantastic news for amateur builders!